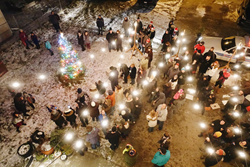 Attendees at the 2016 Corktown-A-Glow gather for the tree-lighting celebration. This event brings neighbors together to enjoy the holiday season and welcomes new guests and visitors to historic Corktown. The Corktown Business Association (CBA) and local business owners are getting into the holiday spirit with Corktown-a-Glow – the second annual community event that brings together neighbors and families, and welcomes shoppers, diners and merriment-seekers to Detroit’s oldest neighborhood to celebrate the holidays together. Special discounts, promotions, holiday drinks and dishes will be offered at area businesses, and guests will enjoy complimentary hot chocolate, roasting marshmallows around a hot fire, caroling with opera singer Giles Simmer, festive drumming with Heritage Works, and photos with Santa. Members of the Detroit Police Department’s mounted unit will be on hand to greet attendees, and the event is topped off with a community tree lighting celebration and caroling. Attendees will have an opportunity to score gift cards and other goodies from Corktown shops, bars and restaurants by filling out a ‘shopping passport’ during Corktown-a- Glow. Also, people have a chance to win a one-night stay at Trumbull + Porter Hotel by sharing the Facebook Event page for Corktown-a-Glow in their newsfeed and using the hashtag #CorktownAGlow (one winner will be randomly selected on December 8). And in the spirit of giving, the CBA is collecting new, unwrapped toys, gloves and socks, which will be provided to the Detroit Police Department for distribution to families in need. 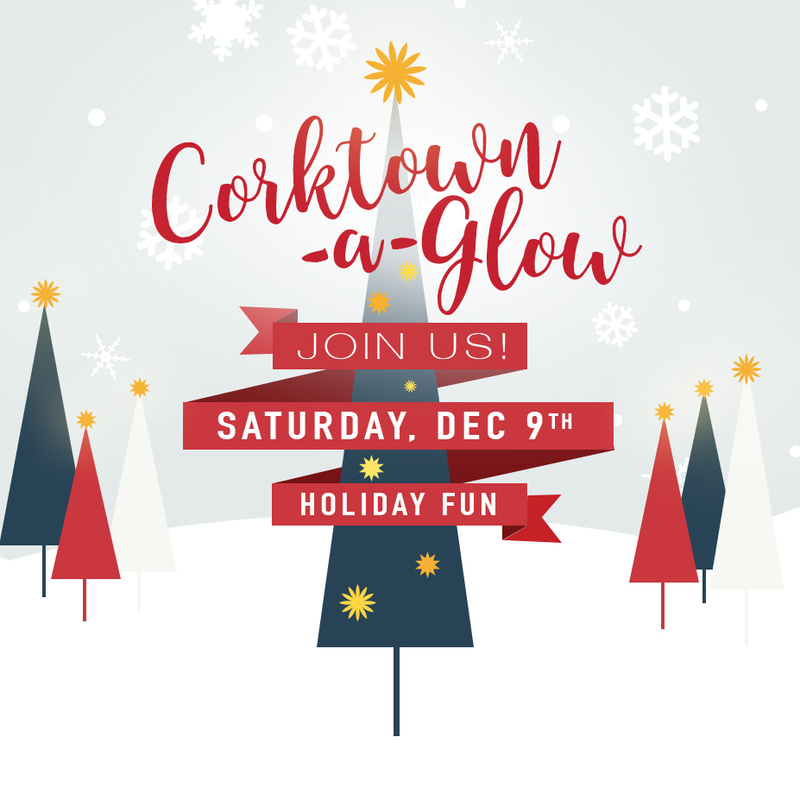 Corktown-A-Glow kicks off at noon on Saturday, December 9. Photos with Santa begin at 5:00 p.m. at Trumbull and Bagley streets, and the tree lighting begins at 6:00 p.m. For more information, visit the Facebook event page HERE. 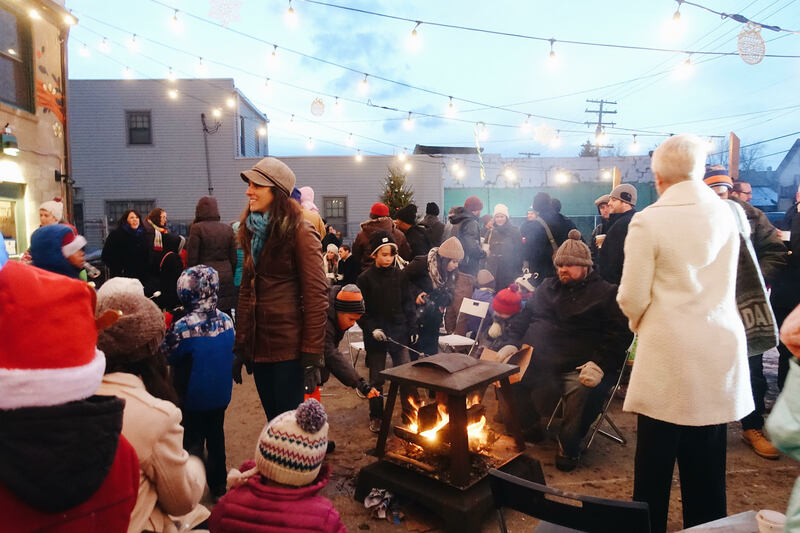 Attendees at the 2016 Corktown-A-Glow roast marshmallows and enjoy holiday festivities. 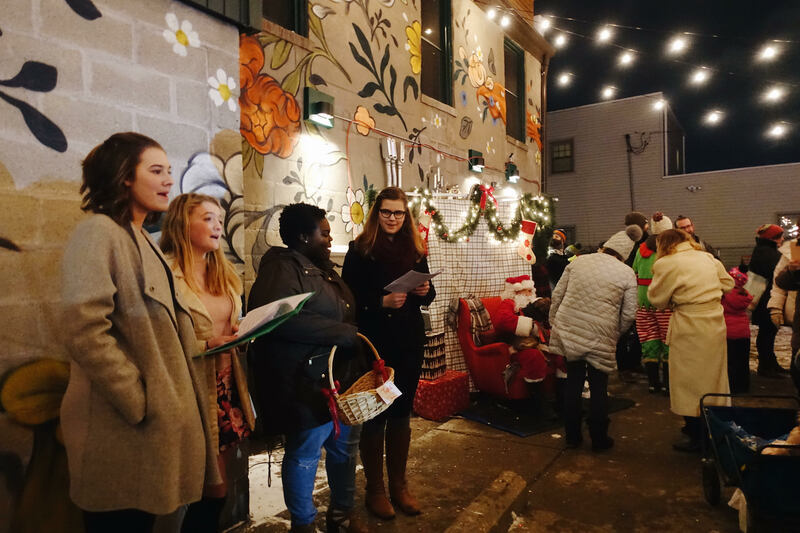 Carolers get into the holiday spirit at the 2016 Corktown-A-Glow while Santa greets younger guests. Flyer for the 2017 Corktown-A-Glow holiday festival in Corktown Detroit.